Connor Shaw #8 of the Chicago Bears passes against the Denver Broncos at Soldier Field on August 11, 2016 in Chicago, Illinois. The Broncos defeated the Bears 22-0. 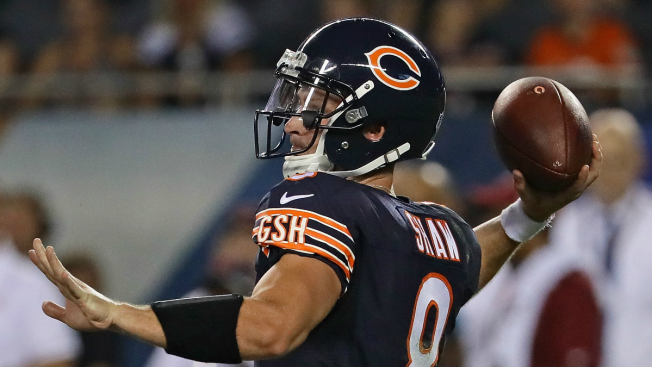 The Chicago Bears have a lot of questions to answer at their quarterback position, but at least one player from the 2016 squad will be back with the team in the coming season. That quarterback is Connor Shaw, who suffered a season-ending leg injury during the 2016 preseason. On Saturday, the Bears announced that the South Carolina product had agreed to a new one-year contract with the team, giving him the chance to likely compete for a back-up role with the squad in 2017. Shaw wasn’t the only Bears player to sign a contract on Saturday, as long snapper Patrick Scales inked a new one year contract with the team. Scales signed with the Bears during the 2015 season, and he started in all 16 games for the Bears in 2016, registering one tackle on the team’s special teams unit. In his NFL career, Scales has bounced around the NFL a bit, spending time with the Miami Dolphins, New York Jets, Tampa Bay Buccaneers, and Baltimore Ravens since he entered the league before the 2013 season.